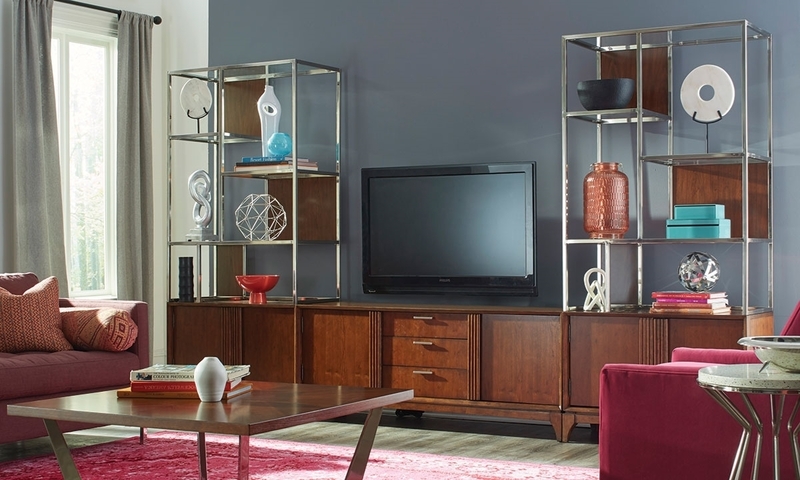 Transform your living room with the ample entertainment, storage and display space provided by the Simply Urban wall unit from Klaussner. This timelessly trendy piece combines the careful artistry of North Carolina native William Mangum with the energy of busy cities. Two 78-inch tall display cabinets reminiscent of metropolitan skyscrapers showcase geometric metal frames in a brushed nickel finish, accented with wood panels and glass shelves. 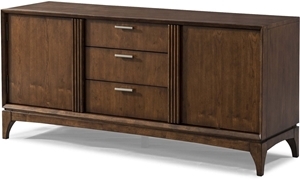 The 62-inch center console and cabinets beneath nod to mid-century modern styling with tambour door details and tapered feet in a warm brown cherry finish.